You might think it’s impossible to reduce your tariff – and in some ways you’re probably right. Whoever connects your electricity will supply it your home forever. If you’ve recently de-emigrated from the UK, you might be relieved by not having to change suppliers every year to get the best deal. If you want a choice in supplier you’ll have to move home – and that’s a little drastic even for the biggest homebugs! But that doesn’t mean you can’t save serious amounts of Rand by making sure you get on the right tariff for you! It doesn’t hurt to be aware that different suppliers can charge very different rates, for example – in Cape Town there’s a split between the North and South — the North is largely provided directly by Eskom, whereas the South and Central districts are mainly provided by the Municipality. For a standard suburban house using 1,000kWh per month an Eskom billed customer will pay R1,240, whereas as City of Cape Town customer will pay R1,550 – more than R300 0r 25% more. All you can really do is ask your municipality why it charges so much and see if they can make reductions. In Durban this year the annual increase was cut from 8% down to 5.5% (yes, we know it’s not much – but 2% is still around R400 per year for a typical household). 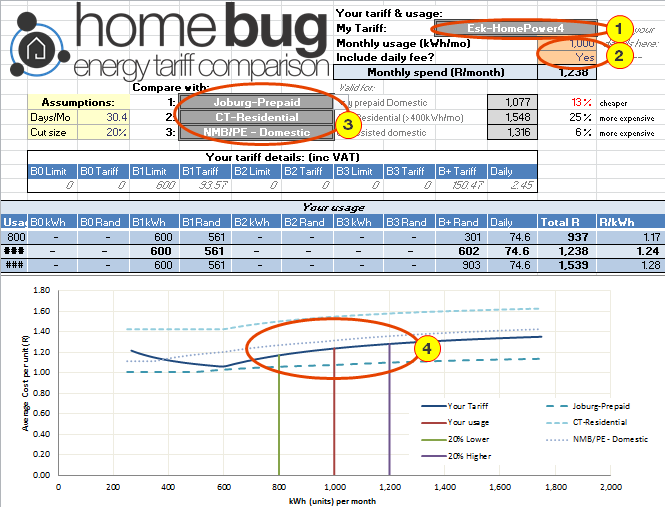 Before we go into each of these, it’s important to understand what your tariff is and how it compares to others. To begin with there’s a little explaining to do about how Inclining Block Tariffs work. What is an Inclining block tariff? Pretty much every home in South Africa is on an ‘inclining block tariff’ or IBT for short. This means that as you use MORE electricity you pay MORE for each unit too. If you increase your consumption you pay twice – once for the extra power and again for the higher cost per unit. This also works in reverse – as you reduce your consumption you get the ‘double-whammy’ of fewer units AND lower cost per unit. The point of this system is to encourage you to use less electricity, but for many people it just means they are very confused. Looking across the larger municipalities it seems there aren’t any national level rules as to when the blocks start and end or how many blocks there can be (although I believe NERSA is trying to enforce a one-block rule). Different suppliers have very different tariff levels and structures! As an explanation of how inclining block tariffs work let’s use an example from the table on the right – Johannesburg City Power prepaid tariff. City Power unfortunately has the most blocks of any of the large municipalities – with 5 different charging blocks. Depending on how much you’ve already used (or for prepaid customers, bought!) during the last month the cost of an additional unit of electricity changes. Our example person will buy R400 each Friday in July. 26th July: Top up another R400. This time though there is enough space in Block 3 — the block from 1000 to 2000 units; where only 101.2 units have been used so far! R400 pays for 328.2 units at R1.219 each unit. There remain 570.6 units in Block 3 unused. When prepaying, other amounts (like unpaid previous bills or daily charges) are taken off the amount that can be spent on credit – for example, with a R4/day charge, a R400 top-up each week would have R28 taken off before the remaining R372 is spent on credit as above. Inclining blocks are different across municipalities, but there are always rewards for reducing consumption! Just looking at a few inclining blocks on a graph you can see what a difference who your connection is from can make but also how your personal usage affects whether your municipality is more or less expensive than another. 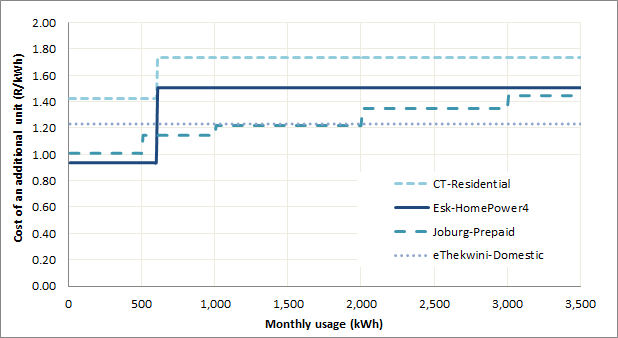 For example, City Power (Jo’burg) Domestic Prepaid is more expensive than Eskom HomePower4 tariff for the first 600kWh, but then is cheaper right up to very high usage levels. We’ve put together the largest municipality domestic tariffs into a spreadsheet for you to compare. You can download it here –> Block Tariff Model Aug13. These inclining blocks can seem very complicated, but they do lead to some opportunities for cost-saving – by cutting your usage at the right times, timing your purchases. We’ll explain more in other posts. To use the spreadsheet just download it and open it in Excel. Next select your tariff from the list (1) (please contact us/comment if we don’t have your tariff) and enter your typical monthly usage in kWh below (2). You also need to chose whether you compare tariffs with or without ‘daily’ fees – only a few tariffs have daily fees, so sometimes comparisons can be better without. Finally select which tariffs you’d like to compare with (see 3). Once you’ve selected these you can see your results in the graph at the bottom. We’d love to hear of any interesting things you find out or if you think we’ve got anything wrong. We’re more than happy to admit we got things wrong and updated our data.